Ralph Lauren | 42'900 € Tax inc. Original, exclusive and unconventional: the new skeleton watch from the American Western collection by Ralph Lauren is a truly unique watch with a style of its own. The American Western skeleton watch is available with a round sterling silver case or with a round gold case and is powered by a manually wound mechanical caliber developed by IWC, the Swiss-made RL 1967. A true high horology caliber by a prestigious high horology watch brand recognized unanimously for the quality of its mechanical movements. Mr Ralph Lauren had already decided to collaborate with IWC for the development of the mechanical caliber of the American Western pocket watch. And just as for the American Western pocket watch, the caliber of the American Western Round Skeleton model is also a manually-wound mechanical caliber. 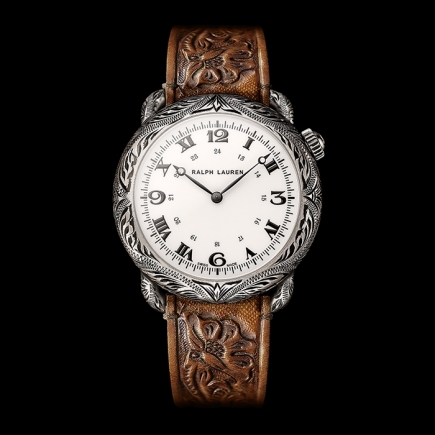 As for the rest of the Ralph Lauren American Western collection, the choice of the caliber to equip each watch was made with the utmost care. 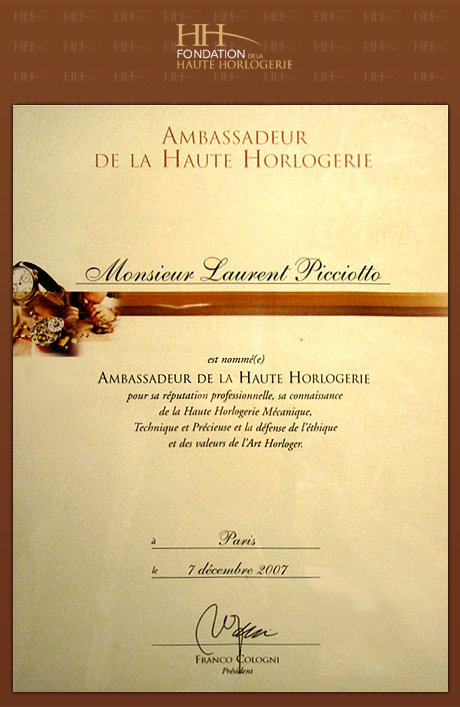 Both the round wrist watch and the cushion-shaped wrist-watch were equipped with a high quality self-winding movement made for Ralph Lauren by Piaget. Each watch of the American Western collection has its own, strong personality and projects an authentic feeling of Western, Texas lifestyle. The Ralph Lauren American Western Round Skeleton watch has a 45 mm case in sterling silver or in rose gold. A hand assembled Swiss mechanical movement powers the watch and the case is beautifully hand decorated. 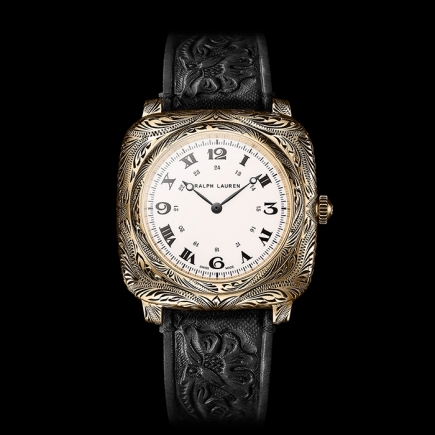 In reality, each watch of the collection can be considered as unique since the weights of the hand engravings of the round-shaped, cushion-shaped or pocket watches are all subtly different. The patina levels of the cases can also vary from one watch to another. 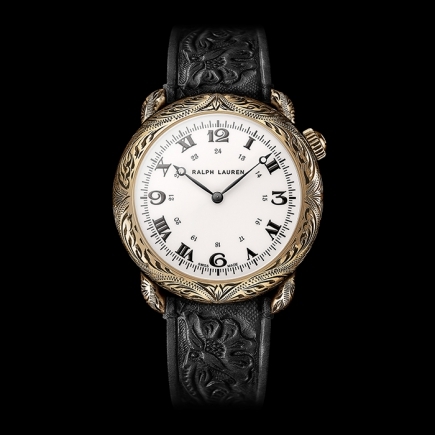 On the long list of exceptional features for this anniversary watch collection by Ralph Lauren, one should obviously also mention the leather straps of the round-shaped and cushion-shaped models. In the pure and iconic Ralph Lauren style, the watches of the collection remind us of the vintage rodeo and concho belts worn by Ralph Lauren himself. The leather straps are hand tooled and burnished in Texas. The round and cushion-shaped watches with an antiqued sterling silver case are equipped with brown calf leather straps. Whereas the round and cushion-shaped watches with a rose gold case are equipped with black calf leather straps. 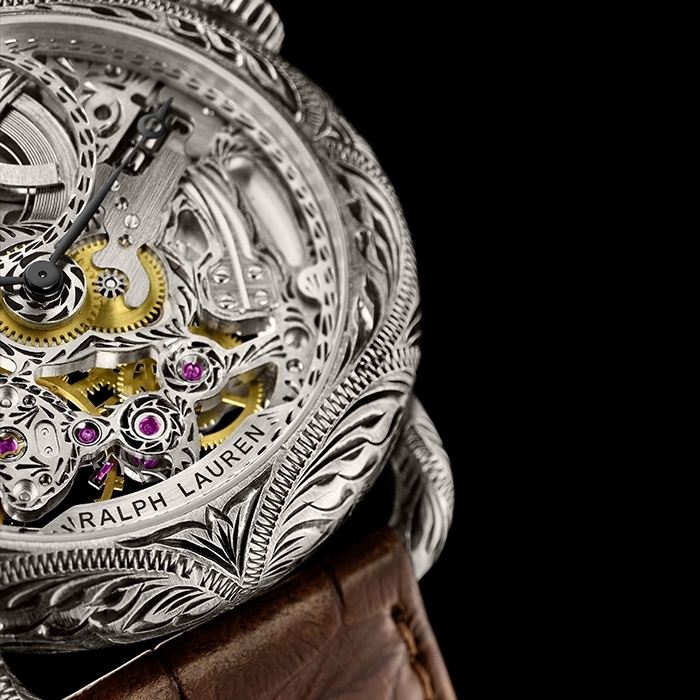 The 45 mm American Western Round Skeleton by Ralph Lauren is truly remarkable and has made a strong impression at the SIHH, the Salon International de la Haute Horlogerie in Geneva. 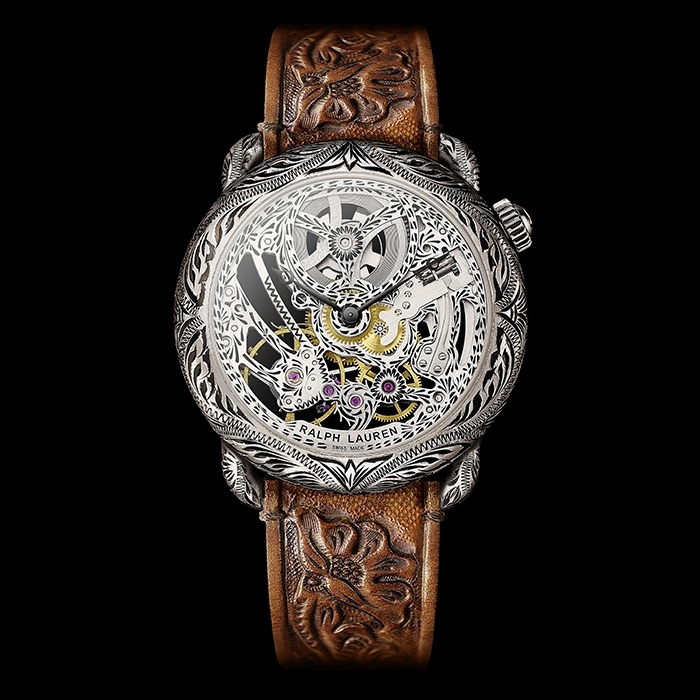 Indeed, with a hand engraved case, a hand decorated and hand assembled movement and a hand tooled leather strap, the Skeleton watch from Texas made a strong impression in the traditional universe of high horology. Ralph Lauren had already showcased his unique style and powerful DNA in the past, legitimately earning the respect of his peers with his Automotive collection, Safari watches or Stirrup watches. Now the Ralph Lauren booth at the SIHH has been struck by some strong, warm winds coming straight from Texas.